Now you can be certain you're lost! 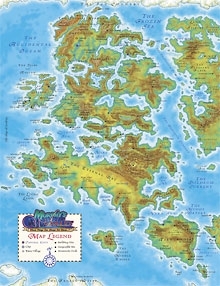 This is a full color map of the Western Hemisphere of Murphy's World suitable for use as an in-game reference or for printing out as a poster. It is very detailed, showing names for numerous capitals, cities, towns, special sites, and even mountain peaks. Now when on an adventure it will be easy to tell where you're lost -- whether it's in the Elvish Isles of Avalon, the harsh and often frozen lands of the Aesir Giants, or the jagged peaks and misty valleys of the Dwarvish kingdom within the Minerva Mountains. This map is a FREE promotional item for use with Murphy's World, a humorous techno-fantasy Roleplay Game available from Peregrine as a downloadable PDF for just $9.99. Murphy's World is a 163 page ebook that can be used as an adventure setting for characters from any RPG or as a stand-alone game (simple roleplay rules are provided based on a d100 percentile system). Please check out Murphy's World and related products by clicking on this link. Bob, Lord of Evil is a 162 page ebook that can be used as an adventure setting for characters from any RPG or as a stand-alone game (simple roleplay rules are provided based on a d100 percentile system). Please check out Bob, Lord of Evil and related products by clicking on this link.